Mr. Kristian Birkeland (1867 – 1917) was a Norwegian scientist. At an early age he showed interest and acumen for physics. Birkeland had an inquisitive and innovative mind. He was very interested in magnetism. His knowledge was used for industrial development and it also led to a theory on why the Northern Lights are formed. Birkeland was a pioneer in studying the magnetic field of the earth and the aurora borealis. The work earned him a professorship at The Royal Frederick University (University of Oslo). Birkeland was the driving force behind the research on the Northern Lights. International research was conducted at Haldde in Alta, Spitsbergen, Iceland, and Novaya Zemlya. Some also regard him as the first space scientist. His theories about the Northern Lights were proven by NASA in 1967. In the aftermath of the yuppie 1980s, the Bank of Norway started to print a new note in Norway in 1994. It was decided to feature Mr. Birkeland and his Northern Lights work on this note. It was the NOK 200 note. For travelers it offers a short cartoon on the most important elements of the original Aurora research. 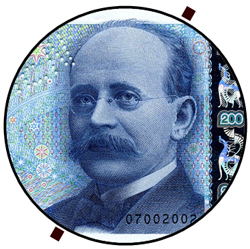 Featured on the front of the note is Mr. Birkeland. The Northern Lights rising upwards toward the North Star are in the background. The Little Bear (Ursa Minor) and the Big Dipper are also included. Birkeland’s terrella experiment, which consisted of a small, magnetized sphere representing the Earth suspended in an evacuated box, is shown on the left. This is where he produced artificial Northern Lights. The snow crystal symbolizes winter, when the northern lights are most visible, and includes a number of security features. The reverse of the note is based on the Northern Lights visible during the day. Whereas the northern lights on the European main land above the Arctic Circle and northern Canada are visible during the night, they are visible over Svalbard, the archipelago north in the Arctic Ocean, during the day. The illustrations in the lower right hand corner of the note depict Birkeland’s thoughts in 1908 about the orientation of electric currents in connection with the Northern Lights. Currents near the auroral arcs flow parallel to the ground, while those that are higher up flow along the earth’s magnetic field lines. These are the Birkeland Currents. We decided to use a couple of Northern Lights notes on our favorite dinner in the Arctic.